Chrome, Firefox, Internet Explorer, and Opera: which one is the most powerful browser? As the window to your online world, your browser is probably one of the most important programs you have on your computer. For this reason, we decided to put the top four to the test to see how they stack up against each other. Unsurprisingly, not all browsers are created equally. Some have more experience, like Internet Explorer, others are open source, like Firefox, some are sponsored, like Google Chrome, while some are shy, like Opera. To properly compare these browsers, we did an objective test in a controlled environment. We used a computer with Windows 7 (which is why we excluded Safari from the list), and established criteria to define the winners: speed, memory usage, and web performance (speed and efficiency). Here, the tests are strictly based on objective rather than subjective criteria, because at the end of the day, personal taste always comes into play when choosing your browser. For a full explanation of exactly how we carried out our tests, check out the complete methodology we used for the browser comparison. To make it even easier, consider each browser like a car: each one serves the same purpose, but some are more suitable than others depending on what you need it for. You wouldn’t use a Range Rover to drive around a race track, just like you wouldn’t use a Lamborghini for off-roading. With this analogy in mind, let’s see how the browsers stack up in each category and figure out which browser is best for you. Every time you start your browser, does it open a new window, or does it open the tabs you had open last time? We wanted to be as close to reality as possible when it comes to browser usage, so in the speed tests, we considered both cases: we opened each browser with a single tab, and then with 11 tabs at the same time. On top of that, we also split the test into two separate trials: cold start-up and warm start-up. For the first, we opened the browser as Windows’ first program. We then closed it, and opened it again for the second round. In this video, you can see the test carried out by opening the browser for a second time (warm star-up) with 11 tabs. 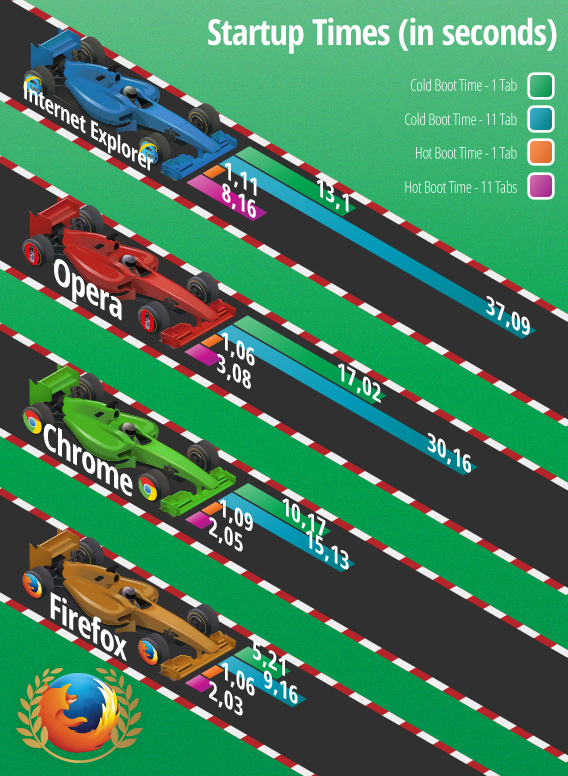 The results speak for themselves: Firefox is the fastest browser. If you’re most concerned with how quickly your browser can open, Mozilla’s browser is a safe bet. The difference with its competitors is significant: opening a single tab in cold start-up is almost twice as fast as the runner-up, and 4 times faster than the last place browser when opening 11 tabs in warm start-up. The silver medal goes to Chrome, while Internet Explorer and Opera struggle behind the other two. What’s interesting is that although Opera is based on Chromium, the same open source browser that Chrome is based on, it was significantly slower than Google’s browser. Given the results, we can’t go without mentioning that Firefox uses a really great trick that gives it an advantage over its competitors when opening multiple tabs at the same time: while Chrome, Internet Explorer, and Opera load all tabs at once, Firefox focuses only on the first one, leaving the rest in the background to load only when you need them. The advantage is considerable: not only does it reduce unnecessary energy usage, it only concentrates on opening the tab you need immediately, making it faster and giving it an edge over the others. 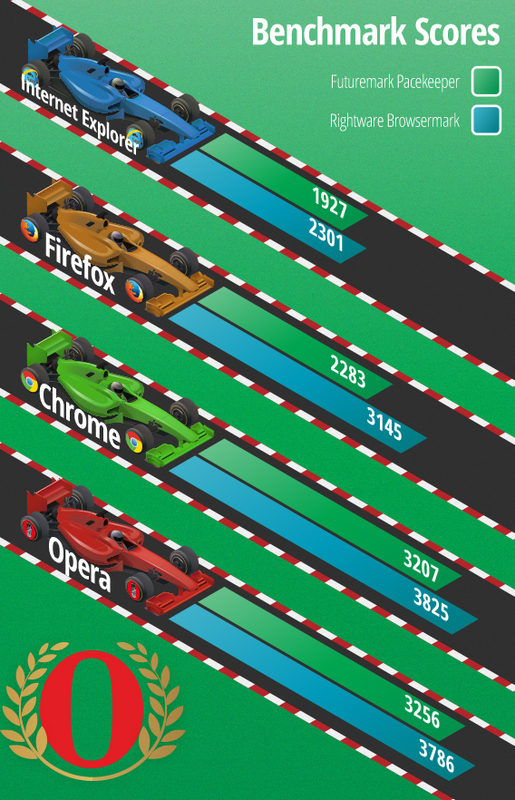 Firefox beats its competitors by a head and takes the lead thanks to a lighter and more streamlined structure. How much RAM memory does each browser use? In other words, does the browser slow down your PC? This is what we took into account in the memory test. We analyzed the consumption of resources in several situations: with a tab open, with 20 tabs open, and with only one tab left after closing the other 19 that were open. For this test, we used Chrome’s memory tool. Although it didn’t win by as much of a landslide as in the previous tests, Firefox clearly came out on top, using the least memory. Going into detail, you can see that Internet Explorer uses less RAM with only one tab open. On the other hand, Firefox is best if you have many tabs open. Chrome was able to free the most memory after closing many tabs, although the difference with Opera is very small. Why is Firefox the best for RAM usage? Not only did it finish first in our tests, but given the fact that you generally browse with more than one tab open, Firefox’s victory over other browsers is actually quite overwhelming. To summarize, Internet Explorer is like a car that optimizes fuel consumption at the start, while Chrome and Opera save resources in the long run. Firefox, on the other hand, optimizes fuel consumption when you need it most thanks to a system that allows it to focus on only the open tab. Mozilla’s browser has the lowest consumption and the best megabyte per second performance. Which browser opens pages the fastest, and which opens websites with the highest quality? To establish the efficiency and speed of each browser, we used comparison sites, websites which measure the performance of a browser through specific tests carried out in real time, directly from your computer. 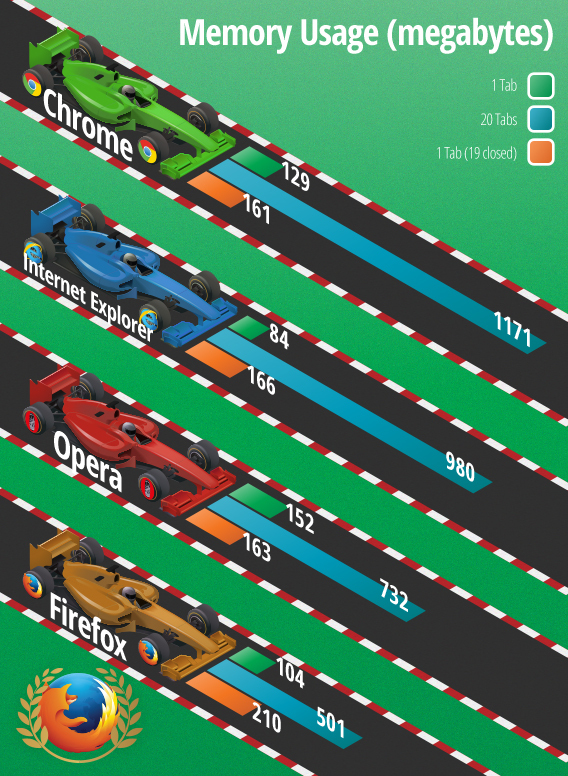 For both sites, Chromium-based browsers Chrome and Opera proved to have the best web performance. With Peacekeeper, Opera was the best, beating Chrome, while with Browsermark, it was the other way around: Google’s browser came in first, immediately followed by Opera. In both tests, Firefox and Internet Explorer are far behind the Chromium-based browsers. The browsers developed by Mozilla and Microsoft placed third and fourth respectively in both tests. Chrome and Opera have the bodywork that hides a very powerful engine, giving them a performance and browsing speed far superior to its competitors. So, what is the best browser? 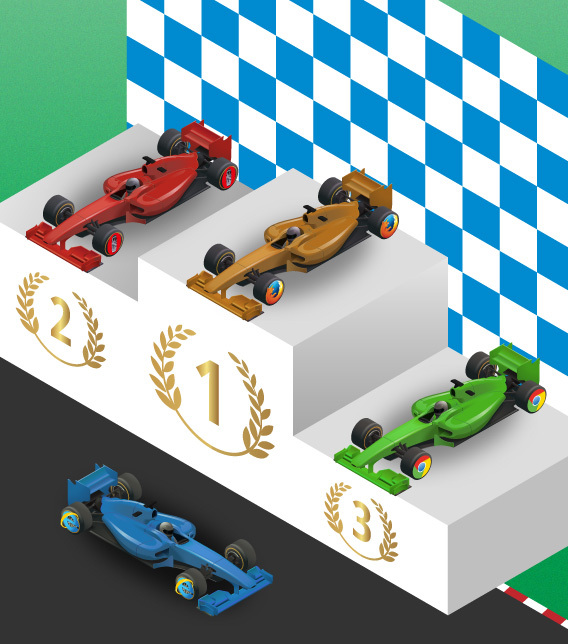 According to the results of our comparison, the best browser is Firefox, winning two out of three rounds, as you can see in the ranking below. In the end, however, your choice of browser will depend on your needs, on the websites you visit, and on how you use it: the best browser is the one that works for you. In fact, there are also many other factors, such as aesthetics, available extensions, integration with other services, and usability, that you can consider. For this reason, we only went through the most basic and necessary criteria to help guide your choice. Firefox is the best browser if you have a last generation computer. It’s fast and uses fewer resources, which guarantees good performance on any PC. It’s like a high-level subcompact: low fuel consumption, and quick. In addition, it’s an open source software that can be customized with many extensions, a smart and reliable choice. Chrome is a good option if you have a powerful computer. Google’s browser (along with Opera) has the best performance and speed online, according to the results provided by the comparison sites. You can think of it as an all-terrain vehicle: big and with a powerful engine, but also heavy and not very agile. With similar features to Chrome, Opera is the browser for those who have a powerful computer but want to be independent from Google. In fact, the Norwegian browser has a longer start-up time but uses less memory than Chrome, and has nearly identical performance online. It’s like choosing a car with an engine manufactured by a famous company but sold to another. On the other hand, Internet Explorer is recommended for those who are faithful to Microsoft. Lagging behind in the start-up speed test and in online performance, it could be better on Windows 8. Internet Explorer is like a locally manufactured engine that fails to succeed abroad. In the coming months, we’ll run tests on the new versions of each browser to see if the updates improve their performance. 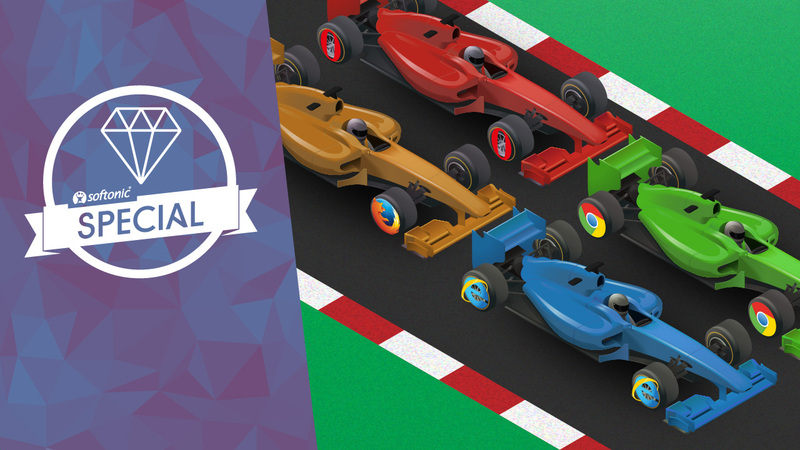 In November, we expect to have Firefox 36, Chrome 38, Opera 25 and (maybe) Internet Explorer 12, so stay tuned for the next race.